Jakarta Vice Governor, Sandiaga Uno affirmed to ensure staple food distribution will be not hampered during Ramadan. This way, food supply and price stability in market can be maintained.
" 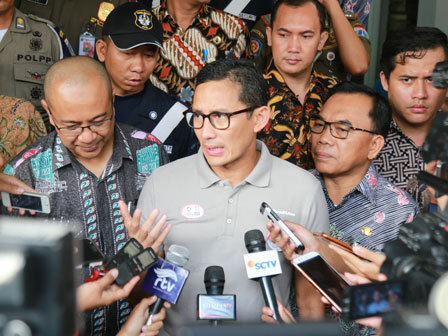 we have ensured food supply won't be hampered during Ramadan"
"Yesterday in Magelang, we had ensured food supply won't be hampered during Ramadan. But we are still anticipating it," he stated, Thursday (5/3). He explained, onion central production in Brebes is located not far away from Jakarta. But if the supply is delayed, price in market will be affected. Thus, his side must ensure food distribution channels to run well within a simple, open, and fair way. "We hope PD. Pasar Jaya, Food Station and Dharma Jaya can cooperate with KPKP Dept. to suppress inflation and maintain the price," he conveyed. PD. Pasar Jaya Director, Arief Nasrudin added, there are 4 foods focused for price stability. Those are garlic, onion, chili and buffalo's meat. "We have good enough in supplying garlic. Garlic price for today is Rp 14 thousand per kilogram in Kramat Jati Central Market," he informed.